Plants usually solitary, globose to short cylindrical, dark green to gray-green, to 12 cm (4.7 in) high and 10 cm (3.9 in) in diameter. Ribs 9-15, round, slightly notched and tuberculate. Areoles elliptical. Spines awl shaped, gray with dark tips, 1-1.5 cm (0.4-0.6 in) long. Central spines 1—4, sometimes absent. Radial spines 5-10. 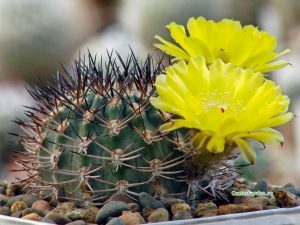 Flowers somewhat bell shaped, bright yellow to red to white, to 4.5 cm (1.8 in) long and in diameter; pericarpels and floral tubes with dark, spine-tipped scales and brown to white hairs and bristles. Fruits globose, dehiscent, hard, to 1 cm (0.4 in) in diameter.